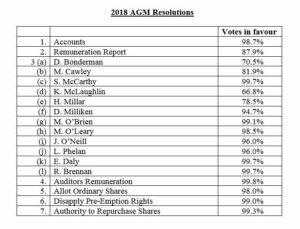 Ryanair Holdings Plc today (20 Sept) held its 2018 AGM, during which shareholders approved all resolutions by large majorities. Details of the voting is set out in the table below. As previously disclosed in the Company’s 2018 Annual Report, Charlie McCreevy and Declan McKeon chose not to seek re-election at the AGM. Chairman David Bonderman sincerely thanked both Charlie and Declan for their substantial contribution over the last 8 years and welcomed both Emer Daly and Róisín Brennan as new members of the Board.